We arrived into Punta Arenas on January 26th and met our US Antarctic Program (USAP) representative, Maribel. During our short time in Punta Arenas, we received our polar gear for the trip, participated in mandatory training sessions, and boarded the N. B. Palmer the next evening. We were underway soon thereafter, a day earlier than expected, to go to the refueling pier on the other side of town. After the hustle and bustle of getting the last non-ship bite eat, grabbing a few bags of dry fruit and loose ends from the store, and hustling to email a few large data files before we have restricted internet bandwidth on the ship, we all made it onboard. Journalist Carolyn Beeler with graduate students Victoria Fitzgerald and Rachel Clark (from left to right) walking off a nice "last meal" along the refueling pier in front of the Palmer the night before its final departure from Punta Arenas. Photo credit: Linda Welzenbach. We enjoyed the most spectacular “leaving port” experience I think I have ever had. It was a beautiful day, but it was the whales that blew our minds. You learn as a marine mammal observer that the spouts are their give-away. Clouds of spray rise into the air, varying in size and shape depending on the breed, and you can see them at quite a distance. Apparently, there was a gathering of at least 50 whales occurring in the bay as we were leaving. A handful of 2-3m (7-15 ft) tall spouts at various distances could be seen in any direction you looked in a moment. Excited debate among our TARSAN seal team members and resident marine mammal experts, Lars Boehme and Guilherme Bortolotto (a.k.a. Gui) from the University of St Andrews in St Andrews, Scotland, deduced that they were Sei whales. Their cousins, the Minke, are a species common both here and in Antarctica where we are headed. Minke whales are small - about the size of an Orca - with a little crescent moon-looking dorsal fin that cuts out of the water when they surface. These looked the same, just with a body 11 m (~40 ft) longer instead. A native Brazilian researcher who studied humpbacks for his graduate work, Gui pointed out how much he would like to come study these giants the next time he ventures down to Punta Arenas. Some whale species give birth in entirely different parts of the world than they feed. Where and why they tend to congregate is often poorly understood and Gui is the type of person who would love to find that out. They certainly put on a show, today, that any whale researcher would salivate over. One of the many Sei whales making an appearance in the bay during the Palmer's departure from Punta Arenas. Photo credit: Linda Welzenbach. A few hours later, the N. B. Palmer made it pier-side on the other side of Punta Arenas to refuel. We got through refueling and in the process of running through pre-checks before our next underway, the rudder did not pass its check. Having spent some time in the Navy, these sorts of hang-ups are familiar. Mechanical issues are usually common on ships. Waves constantly beat up machinery. Saltwater is hard on parts. Kelp, algae, and barnacles like to make a home on the hull or tangle around parts (called bio-fouling). It’s par for the course on a ship. To be honest, though, this is my second cruise on the Palmer and I have been surprised by how rarely mechanical issues come up on this ship. This is easily the smoothest-running ship I have seen, despite its 25 years of age and the extreme weather and environments it is constantly subject to. It makes sense since the Palmer runs a level of work that requires no margin for error. Science time in the Antarctic is precious beyond measure, expensive, and there is no one out there to save you if you break down, so the crew has to be better than anyone else at keeping the ship purring like a kitten. Passengers are fortunate on this ship: 40ft seas with 60ft rogue waves, or ice thicker than I am tall, piece of cake. For the rudder, all we needed was an extra day in port, a couple visits by divers, and the ship was ready to go. Scientists giving their last send off to Punta Arenas as the ship got underway (Meghan Spoth, Lars Boehme, Bastien Queste, Peter Sheehan, Gui Bortolotto, Mark Barham, and Carolyn Beeler, from front to back). Photo credit: Tasha Snow. On January 28th, we watched as Punta Arenas fell away behind us, not to return until March 22nd. First, we were headed for the Straits of Magellan and a testing of the Hugin Autonomous Underwater Vehicle, then the legendary Drake Passage in the Southern Ocean, and beyond that, the ice. Only a few whales and playful pods of Peale’s dolphins on this departure, but the energy was sky-rocketing. Scientists and crew alike were literally bouncing up and down or grinning from ear to ear, the veterans even more so. Those of us who have been here before, sailor and scientist alike, know what waits for us in the ice and can’t get there soon enough. There is an enormous amount of ground-breaking science that will be done soon. 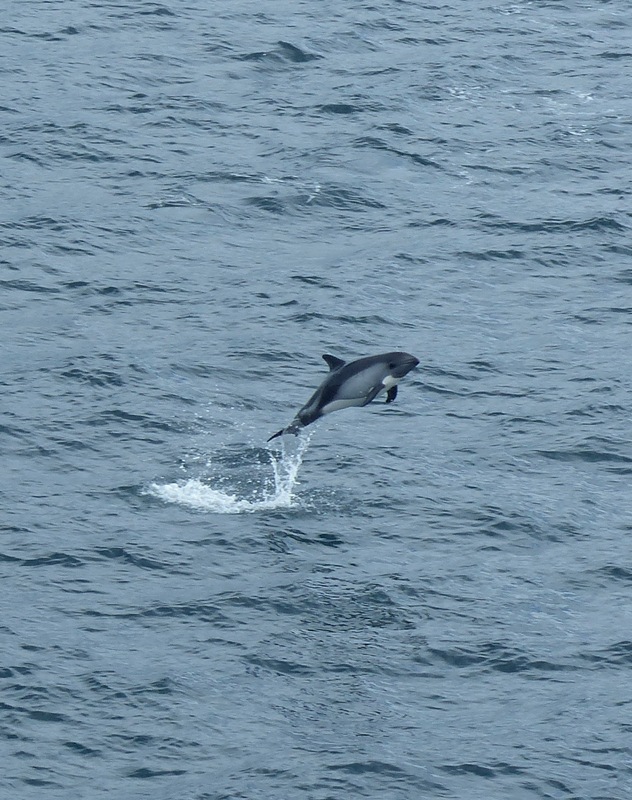 A Peale's dolphin catching some air near the bow of the ship. Photo credit: Tasha Snow. The ship's planned route from Punta Arenas out to the Southern Ocean. Photo credit: Linda Welzenbach.